NOTE! Zandalari and KT may not work correctly yet! Sorry for the long pause between versions, been enjoying Legion so far! * Added Demon Hunters to filter. cleaned up some of the code and changed level range from 20-100 to 1-110. Last edited by Eldarix : 09-27-18 at 03:23 AM. I'm having all the exact same problems listed previously. I click on 8.0, and I get the old 7.7, which doesn't work. All I get is the SGI window, empty, no text, no fields, nothing. Is this going to get fixed? There are probably thousands of people who rely on this app! Thx! The addon is not working and also the one we downloaded from download button was only version 7.7 rather than latest version. Thankful for this fiasco. As a GM this was kind of a major necessity for me as lazy people will never invite anyone to your guild so you gotta do all the work...and provide the bad people with guild repairs (which they will never add to) and on top of that they want you to chat with them 24/7 now. 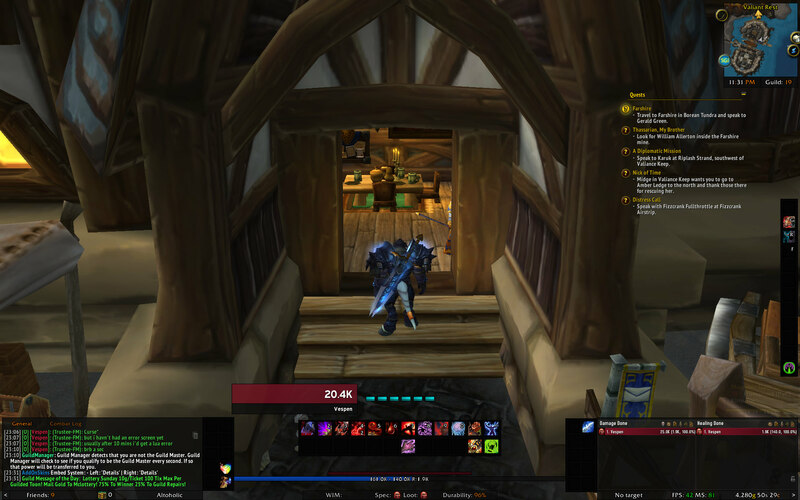 Now that this addon is not working I have finally hit the unsub button on battle.net. *Deep breathe*. It's for the best. Last edited by BluTiger : 07-19-18 at 07:03 PM. Is this addon working for live? I can get it to come up and run a search but it seems to come up with very few names. I always used choose invites in the past and usually the list would be very long quite quickly but now it can scan for 10 minutes and only come up with 1 or 2 names. (*temporary) = "attempt to call global 'RegisterAddonMessagePrefix' (a nil value)"
(*temporary) = "attempt to index global 'GuildShield' (a nil value)"
(*temporary) = "attempt to index field 'L' (a nil value)"
Last edited by dadstiac : 05-11-18 at 04:47 PM. The addon does nto show up in my addon folder after I updated it. It is gone. Found that in your GUI lua file that the img path for the texture wasn't adjusted for the file name change from "SuperGuildInvite2" to "SuperGuildInviteReborn". If you would like to donate to help keep development going on this and other addons, I would be very grateful.